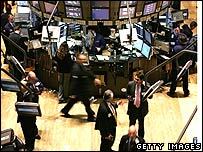 Markets worldwide recorded heavy losses in reaction to the emergency bailout of US investment bank Bear Stearns over the weekend. Wall Street had a rollercoaster day, with the benchmark Dow Jones average ending in positive territory - up 0.18% - after tumbling in early trading. European shares suffered most, with the UK's FTSE 100 index ending down 3.9%. Investors fear that the collapse of one of Wall Street's biggest names means that the credit crunch is escalating. In a further attempt to calm credit markets and ward off a recession, the Federal Reserve is expected to cut its key interest rate by an unprecedented one percentage point when it meets on Tuesday. The Fed is desperately trying to restore confidence in the banking sector. As the economy worsens, banks and financial institutions are calling in loans and becoming increasingly reluctant to lend money to borrowers, particularly those considered to be high risk. Bear Stearns got into trouble when other banks refused to lend it money over fears that it had too many bad debts due to the sub-prime mortgage crisis. US, UK and European banks were hammered: shares in Lehman Brothers fell 19%, UBS lost 10%, HBOS 12.7% and Germany's Commerzbank fell 6.8%. However, the Dow Jones ended up 21.16 points at 11,972.25 after tumbling 194 points at the start of trade as investors took heart from JP Morgan's takeover of Bear Stearns, which was backed by the Federal Reserve. "Investment banks are getting their heads handed to them, but at the end of the day the Federal Reserve is stepping up every time and creating a process by which the markets will be allowed to recover," said Michael Williams at Tocqueville Asset Management in New York. The broader Standard & Poor's 500 Index fell 0.90%, while the Nasdaq Composite Index, dominated by technology stocks, closed down 1.6%. Earlier, France's Cac 40 closed down 3.5% and Frankfurt's Dax tumbled 4.1%. US President George Bush attempted to reassure investors on Monday. "We are in challenging times," Mr Bush said at a press conference. But he added that the US authorities were "on top of the situation" but "when need be, will act decisively, in a way that continues to bring order to the financial markets." "In the long run, our economy is going to be fine". Under scrutiny after the steep fall in its share price, Lehman Brothers also attempted to reassure investors on Monday about its financial situation. "Our liquidity position has been and continues to be very strong," Lehman Brothers said in a statement. Asian stocks also fell, with Tokyo's Nikkei average closing 3.7% lower and Hong Kong's Hang Seng slumping 5.2%. In Mumbai, the Sensex was down 6.5%. Central banks have been trying to restore some confidence to the financial system. On Sunday, the US Federal Reserve reduced its discount rate - the interest rate at which it lends to commercial banks - from 3.5% to 3.25% and offered to buy up the assets of other troubled banks. To ease fears in the UK, the Bank of England on Monday made an extra £5bn ($10bn) available for UK banks to borrow. Banks scrambled to access the funds and the Bank of England's offer was nearly five times over-subscribed. "Given the money market conditions this morning, the situation is very serious and represents a new and unwanted twist to the credit squeeze," said Philip Shaw, chief economist at Investec. "Five billion pounds represents a substantial sum." Overnight inter-bank dollar lending rates have risen sharply in London to levels not seen since 11 September 2001, reflecting growing unease about the health of the US financial system. Investors' confidence has been hit by the problems at Bear Stearns. The investment bank was forced to seek emergency funding from the US Federal Reserve last week and was sold over the weekend to JP Morgan Chase for a tiny fraction of its earlier value. The Fed has agreed to take over up to $30bn of Bear Stearns' assets, removing the risk for JP Morgan. The quick sale failed to calm investors' nerves who, this week, will receive earnings announcements from other big US investment banks, including Lehman Brothers, Goldman Sachs and Morgan Stanley. "There is persistent credit uncertainty. Market players have been repeatedly let down which shows the sub-prime mortgage problems are so deep-rooted," said Atsuji Ohara, global strategist at Shinko Securities in Tokyo. "Just buying an investment bank does not solve the problem," he added. Worries about the credit crisis and the health of the banking industry also undermined the dollar. It fell to 95.72 yen, its lowest level in more than 12 years. The euro hit a record against the dollar, buying $1.5904. The weak dollar boosted commodities, with oil rising to another record, light sweet crude traded at $111.80 before falling back. The dollar is also falling because of the expectation that the US Fed will cut interest rates further, making it less attractive to hold dollars as opposed to other currencies.